Regularly eating fish and shellfish provides lean protein and high amounts of omega-3 fatty acids, which reduce your risk of cardiovascular disease and diabetes. 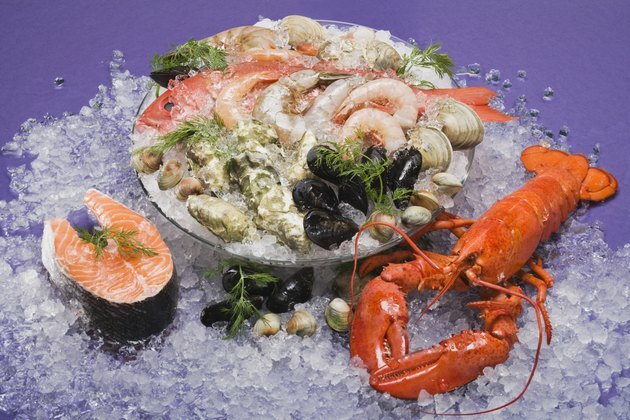 A seafood diet uses fish and shellfish for your primary protein sources -- if this is something you're interested in, try it for a week to see if it's right for you. Always consult your doctor before dramatically changing your diet. The Food and Drug Administration urges women who are or may become pregnant, young children and nursing mothers not to eat fish that are high in mercury. These varieties include shark, swordfish, mackerel and tilefish. Egg-based breakfasts typically go well with fish and shellfish. For something quick, try scrambled eggs with salmon or crab meat and a couple handfuls of leafy greens. Serve the scramble on whole-grain toast or in a tortilla for a more filling breakfast. An English muffin with a fillet of tilapia or cod and a slice of low-fat cheese is another tasty seafood breakfast, as is an egg casserole with shrimp or scallops. If you have leftovers from a seafood-based dinner or lunch, don't hesitate to reheat them, add a slice of toast or a piece of fruit and call it breakfast. Salads and sandwiches are healthful lunches that work great with seafood. For example, have an arugula salad loaded with vegetables and toss it with scallops, steamed prawns or oysters. Alternately, make a creamy seafood salad with beans, corn and plain yogurt to use as a sandwich filling. Fish fillets of any variety paired with a few fresh vegetables make tasty fillings for sandwiches, wraps and pitas. Another lunch to try is steamed fish over rice or another whole grain and seasoned with lemon or lime juice. Pastas, soups and stir-fries are excellent seafood-based dinners, and most don't require a lot of time to prepare. Try pasta in low-fat Alfredo sauce tossed with cod, founder, scallops or sole. You can also make a big batch of clam chowder or jambalaya soup as dinner for the next several days. A stir-fry with almost any kind of seafood and fresh vegetables served over cooked whole grains is another easy choice. Have a banana or a handful of berries for dessert to help make your meals balanced. Seafood snacks aren't as uncommon as you might think. For example, fish jerky is tasty, portable and available in a wide range of flavors and varieties. Canned seafood like oysters, tuna, sardines and herring make nutritious snacks as well. If you're preparing snacks for a crowd, try shrimp cocktail, muscles or oysters. You don't need seafood in every meal of the day, every day of the week. To minimize your mercury intake, focus on low-mercury seafood that like salmon, shrimp, canned light tuna, pollock and catfish. A sample day on the seafood diet could start with a spinach and Swiss cheese omelet and a banana for breakfast, and then a snack of salmon jerky. For lunch, you could have a chickpea salad tossed with tomatoes and mangoes, and then for dinner a bowl of clam chowder with a slice of toast and fruit salad for dessert.